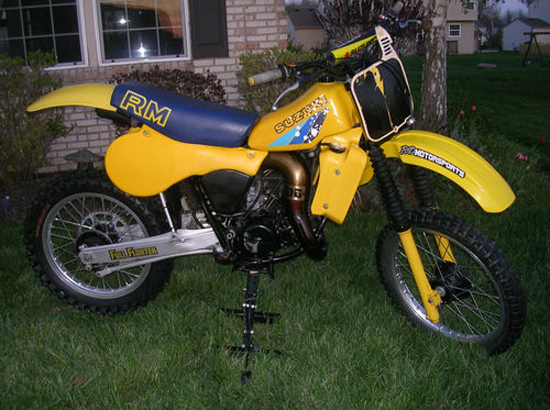 1983 Suzuki RM125 motocross bike in great survivor condition. Bike runs, starts, shifts and stops great. Great AHRMA post vintage motocross weapon in unrestored, low hour, condition. Still has the kickstand! Original graphics on the tank and seat cover with no tears, rips, cuts or damage. Front fender is modern and not correct for the 83 RM125 model. This bike is ready to be raced today, nothing to fix. Has DG performance pipe is great condition with no dings. Also comes with the orginal owners manual and a new, still in the bag, from number plate. I believe the front plate is a DC plastics plate and not OEM. Please email with questions, check the link below for many more pics of the bike. Thanks. I have some fellow vintage racer friends that are headed to Diamond Dons in April so I may be able to have the bike delivered there too.